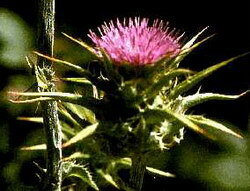 Often reportedly used in emergencies for mushroom poisoning, Milk Thistle offers protection from alarmingly widespread environmental toxins and recent studies have shown milk thistle may inhibit the development of many forms of cancer. It enhances the production of metabolic antioxidants naturally, and its use can be traced back to the first century! These seeds are often ground in a coffe grinder and added to cereals, smoothies, salads, or soups. They can even be sprouted and eaten like sunflower sprouts.